Fanning marriage records for Bourney & Corbally Catholic Parish in Co Tipperary & Co Offaly: 28 June 1836- 1880. 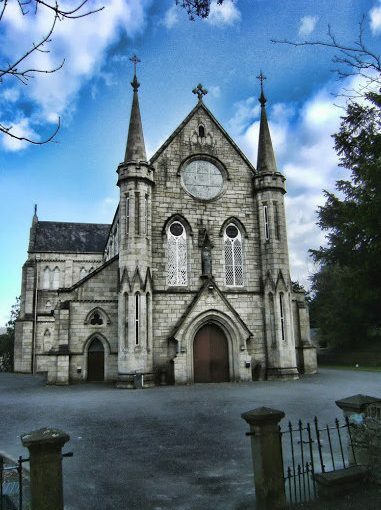 This parish is in the Diocese of Killaloe. 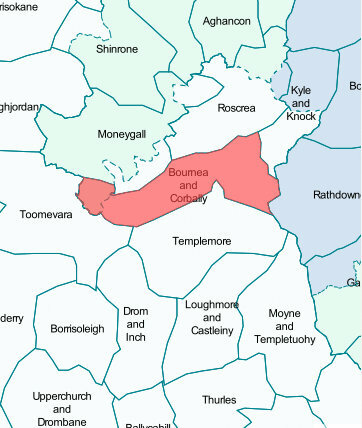 Variant forms of the parish name are Corbally, Bournea & Couraganeen. Rootsireland is an excellent subscription service with search options. Makes using the free National Library records much easier. 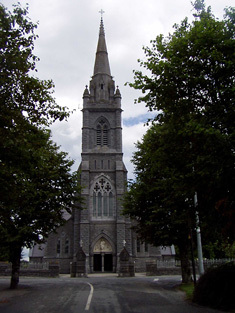 Rootsireland has Cournageen (Bourney) Parish marriage records from 1836-1880, with 1873 missing. 21 Feb 1857, William Fannon & Sera Guidera, wit: Philip Fannon & Johanna Guidera. This couple emigrated to New Zealand with most of their children. I have written a post about them, William Fanning and Sarah Guidera. I noticed that from the time of William and Sarah’s marriage in 1857 within three days two other Guidera marriages had taken place. Between Feb 1857 and Feb 1863, a total of eight Guideras had married. I wonder if these marriages were prior to emigration. 14 Feb 1895, Bourney Civil Marriage record. William Fanning, age 28, farmer of Loran & Margaret Coonan of Ashmere, age 26. His father William Fanning, her father Michael Coonan. Witnesses were Michael Hardgrove & Mary Coonan. Married in Couraganeen RC Church. After 1867 there were so few marriages one wonders if this was the result of the famine and mass emigration from this parish. 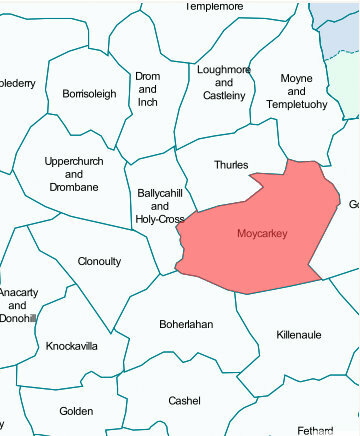 The variant name for this parish is Corbally. 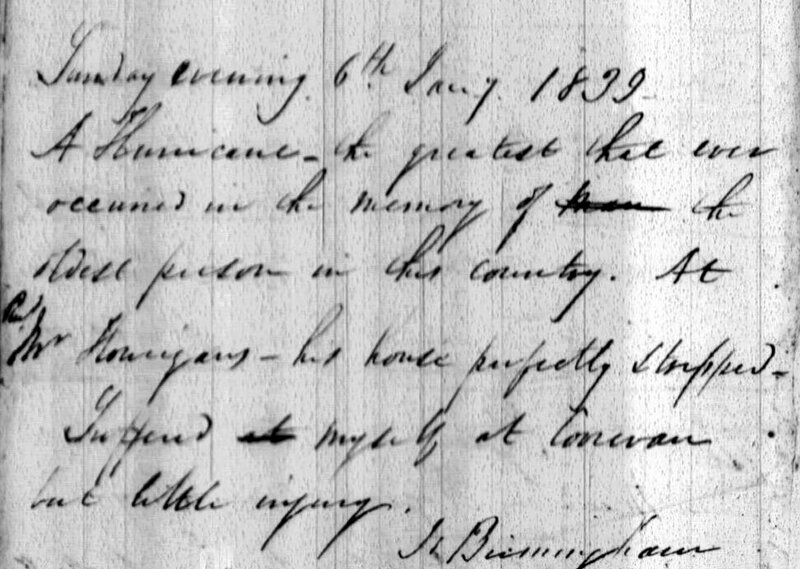 Fanning marriage records for Dunkerrin Parish (Moneygall & Barna): 1820-June 1875. 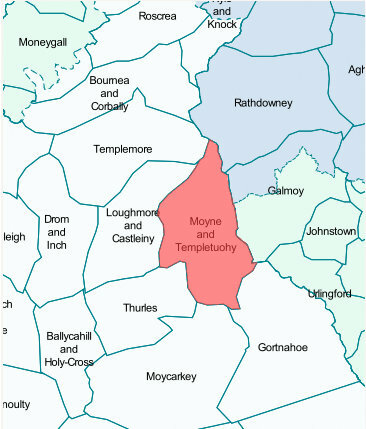 The parish is in Co Tipperary & Co Offaly. These records are form the National Library of Ireland’s site. I looked through these marriage records as William Fanning and his brother Philip married two Eviston women, most likely sisters, from Loughmore Parish. My Fannings are related to the Evistons. I was interested to see if there might be a connection to the Fannings from Lissaroon. I couldn’t find anything to indicate this other than Martin Eviston’s involvement. 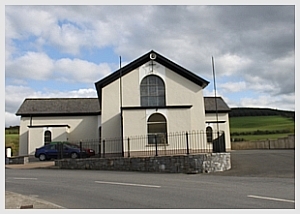 Rootsireland has marriage records for this parish from 1820 to 1911 and irishgenealogy.ie has civil marriage records from 1864. 29 Jan 1857, John Madden & Anne Aston, Castlerone wit: Philip Fanning & Jane Stoney? 3 Mar 1859, Philip Fanning & Eliza Doyle Ballyrusheen? wit: Philip Fanning & Ellen Mussey? 11 May 1862, Patrick Dalton? & Margaret Maher wit: Thomas Fanning & Mary Derran? These marriage records from the National Library of Ireland’s online site, start at 1793 and end in 1881. They include any records with a Fanning bride or groom or a Fanning witness. 5 Feb 1833- 2 May 1854; 13 Sept 1854-30 Oct 1881. At the Rootsireland site marriages start Oct. 1793, gap 1797-1809, 1818-30, continuous from 1831. I have added a few Fanning civil marriage records at the end. 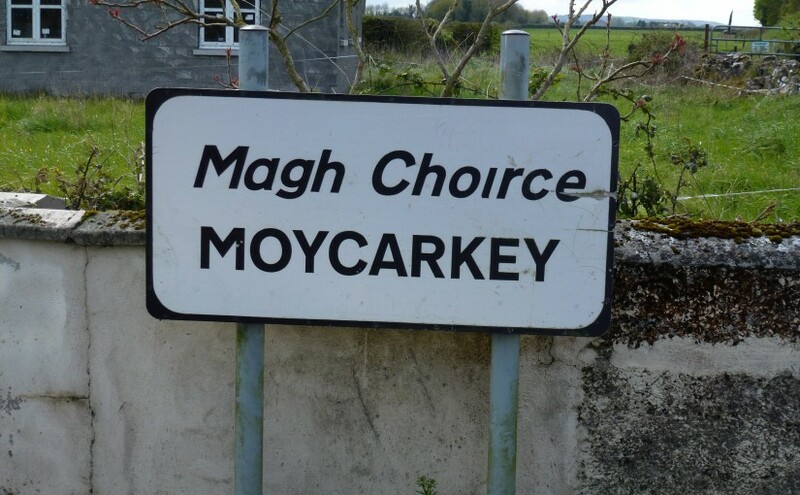 6 Feb 1837, Patrick Fanning & Jude Gueney of Moycarkey wit: Joseph Fanning & Janise? Carrol? 4 Apr 1837, John Mallone of Borrisoleigh & Anty Fanning of Moycarky wit James Cummins? & Mary Ryan? 13 Sept 1844, Samuel? Dwyre of Holycross & Cath Fanning of Moycarky wit: James Cantwell? & Mary Loughnane? 6 Mar 1848, James Russell & Judith Fanning of Moycarky wit: John Russell & Ellen Lions? *25 Feb 1897, James Fanning of Lisdanowly Moyne, farmer & Anne Hogan of Coolkip. Patrick Fanning is father of James and Patrick Hogan father of Anne. Wit: Michael Fanning & Margaret Hogan. civil marriage record. 11 Feb 1902, Edmund Fanning, farmer of Holycross & Hanoria Molloy of Ballybeg wit: Francis Dwyer & Bridget Fanning. Husband’s father was James Fanning, wife’s father was John Molloy. Civil marriage record. *17 Feb 1908, John Fanning, farmer of Loughmore & Mary Hogan of Moycarky wit: Patrick Bannon & Sara M Hogan. John’s father was William Fanning of Clondoty and Mary’s father was Patrick J Hogan. These Fanning marriage records are from the Catholic Parish of Loughmore & Castleiney in the Diocese of Cashel & Emly in Co Tipperary. They cover the periods 16 April 1798 to 26 June 1840 and from ^ Sept 1840 to 2 August 1883. They are online free through The National Library of Ireland. 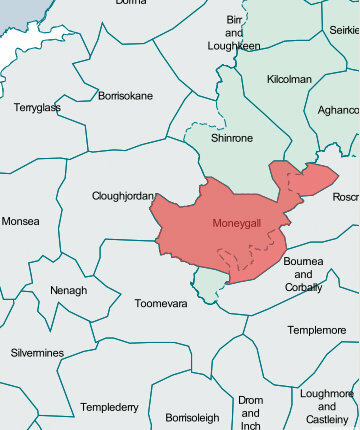 Rootsireland, which is not free but has reasonable fees, has marriage records for this parish from 1798 to 1897 with no gaps. 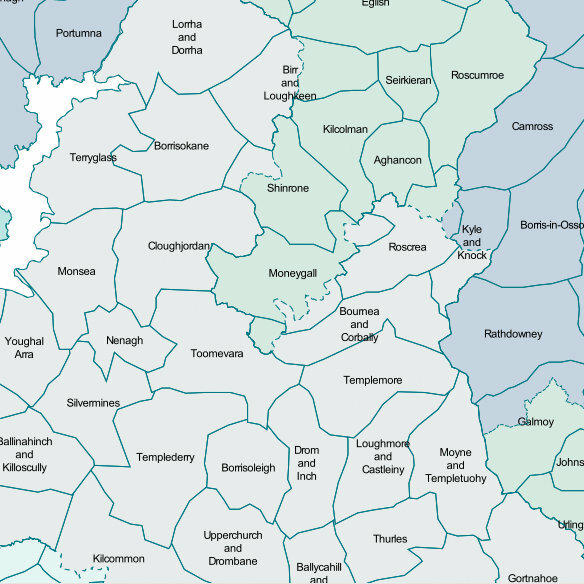 Places in Loughmoe West in civil records: Ballybristy, Carrickloughmore, Clondoty, Kilkillahara, Killahara, Laghile, Lisheenataggart, Loughmoe Town, Rocker, Tinvoher, Whitefield. There were no Fanning marriages in the period 1798-1800. If the groom comes from another parish this is recorded otherwise no addresses given until 1811 when Rev Thomas Morrissey begins putting addresses of both bride and groom and occupations. 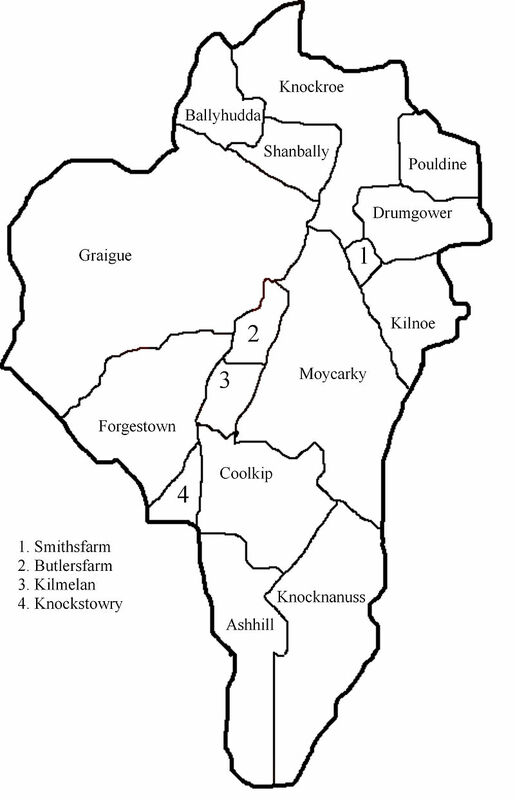 23 Feb 1830, William Fannin & Catherine Butler of Loughmore, wit: Michael Cahil, John Fannan & Margaret Flanagan? 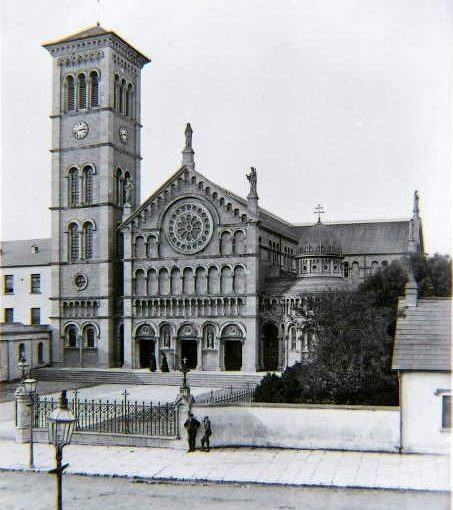 14 Aug 1855, Denis Tierney & Margaret Hackett, wit: Michael Fanning & Cath ? 1 Nov 1870, Patt Delaney & Ellen Gleeson, wit: John Fanning & Ellen Gleeson Kilnasure? 28 Feb 1881, Edmond Carroll & Mary Fanning, wit: Malachy Carroll & Mary ? 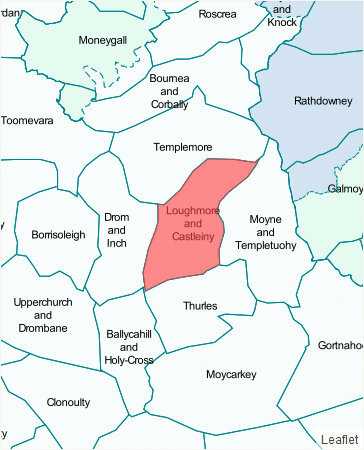 Given the number of Fanning marriages it is clear that there were a lot of Fanning families living in Loughmore during the period 1801 -1882. So far this area has by far the greatest number of Fannings living in it. That said, I have yet to look through the Thurles records, where I suspect there are even more Fannings. There were very few Fanning marriages or Fanning witnesses in this parish from 1807 to 1849 although there are gaps in the records. 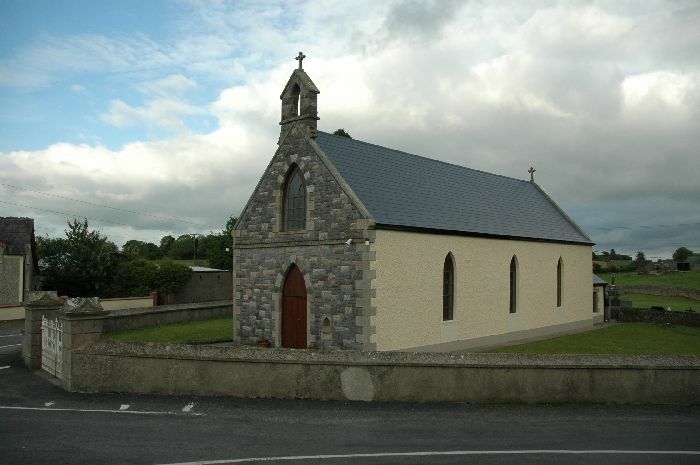 These marriage records from Templemore Parish in the Diocese of Cashel & Emly, Co Tipperary are from The National Library of Ireland site and are online and free. The dates covered are 15 Nov 1897 to 13 Jan 1820 & 30 Nov 1809 to 23 Oct 1849. 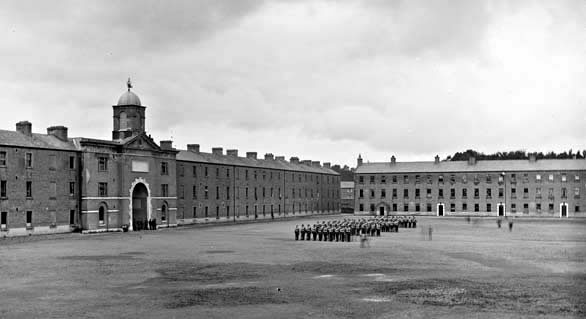 There were however a number of marriages to soldiers no doubt due to the military barracks at Templemore. None involving Fannings. In the early records addresses and sometimes occupations were also recorded. Places where the marriage took place are given, most likely the bride’s home. 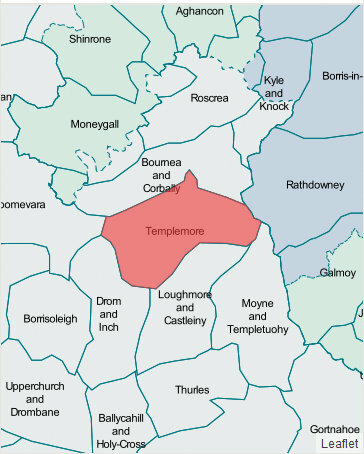 Other names for Templemore are Kilvenogue, Kilvenoge, Killea and Clonmore. 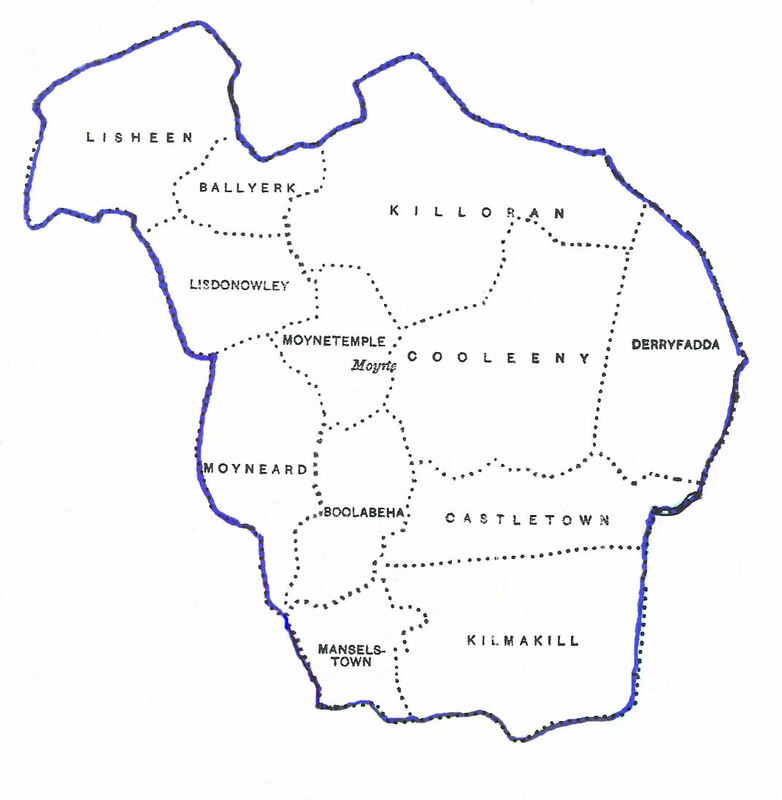 Places names in Templemore in 1901 & 1911: Adamstown, Ballycahill, Ballyheen, Barnalascaw, Belleville, Borrisbeg, Butlerslodge, Clontaaffe, Craiguedarg,Culleenagh,Curraduff, Eastwood,Farranacahill, Farranaderry, Forest, Graiguebeg, Greenwood, Ivyhall. Jockeyhall. 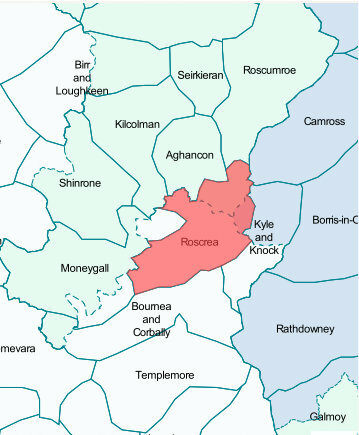 Kilclareen, Killawardy, Killough, Kiltillane, Kiltilliha, Knockanroe, Kylebeg, Lisnaviddoge North, Lisnaviddoge South, Lloydsborough, Manna North, Manna South, Oldtown, Priory Demesne, Rossnamanniff, Lower Rossnamanniff, Upper Sandymount, Templemore Demesne, Templemore town, Woodville. 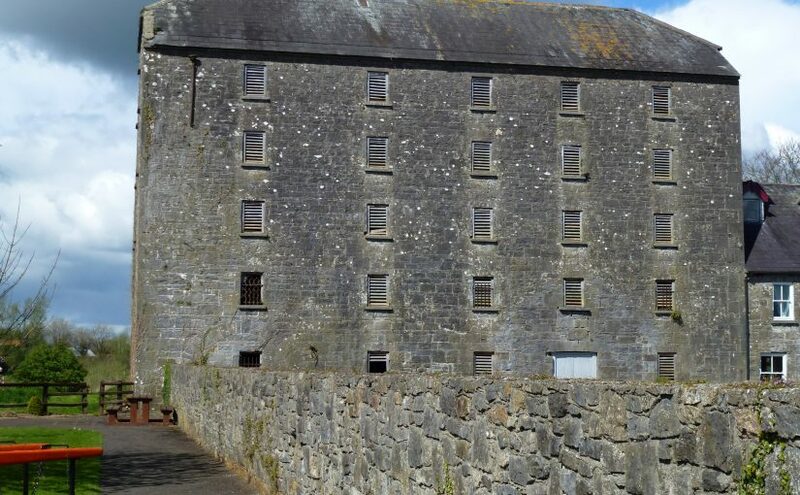 Rootsireland has marriage records for Templemore Clonmore starting in Nov 1807, with a gap from Sept 1826-1833 and then their records are continuous from 1834 to 1900. From 1864 civil marriage records for Catholics were required to be kept. These are now online and free through irishgenealogy.ie Marriage records over 75 years are on this site. 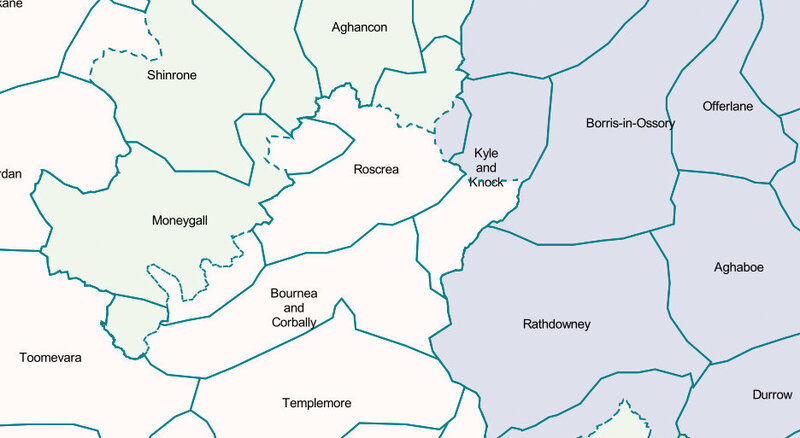 *17 Oct 1835, Clonmore, Michael Brennan & Joanna Keys, wit: Thomas Hurley & Catherine Keys. I have put this record and the following record in as I am trying to connect Michael Fanning and Catherine Keyes. He married her in Templemore on 4 Feb 1833. He was my gggrandfather’s brother. *9 July 1841, Andrew Brennan & Margaret Keys, wit: Martin Eviston & Mary Morrissey. The surnames Eviston, Keys and Morrissey are all in my family tree. This Martin Eviston’s mother was Margaret Brennan, so Andrew may well have been his cousin. Martin was also married to Johanna Fanning. A Daniel Morrissey married Catherine Fanning of Lissaroon on 22 Feb 1838. *24 Nov 1845, Patrick Kinane? & Mary Keys married in Templemore, wit: John Morrissey & Johanna ? 7 Nov 1904, William Fanning of Dunkerrin & Anne Maher of Poulong, both farmers. William’s father was Thomas Fanning, a farmer and Anne’s father was Philip William Maher also a farmer. Wit: Ellie Maher & Thomas Fanning Civil marriage record. Married in Templemore RC Church.